I’ll never forget the context in which I first heard the term “Millennial” as it was used to describe a group of people: I was talking to a friend that held a management position in the company that she worked for and was talking about how their corporate headquarters was passing down new directives for training and dealing with a generation of workers who fell into the “Millennial” age bracket. At first, I thought the idea of changing how a company operated based on the age of their employees was absurd. As it turns out, the generational gap is more of a gaping chasm, as opposed to a “gap”. 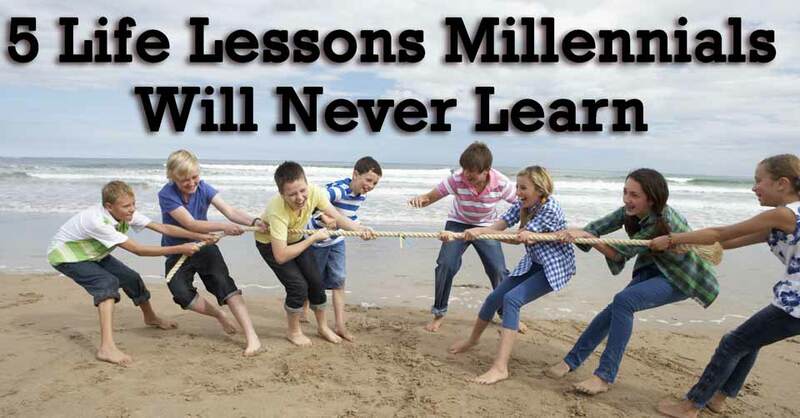 The more I have learned about Millenials, the more I see that there are important life lessons that Millennials will never learn, and honestly – it worries me. Gone are the days of winning and losing. I remember the first time I went to one of my nephew’s football games and made the mistake of asking what the score was. “We don’t keep score, that way none of the kids are upset,” said one of the mothers of one of the children while looking at me like I had an arm growing out of my head. Are you serious? What is the point of competing if no one wins? What lesson does that teach for life? Losing is the only way to ever get better. You have to figure out why you lost, address it, and improve. Giving every kid a trophy for participating is like handing out a paycheck just for showing up – no matter how well or terribly you do your job. Remember the days when disputes were settled by saying “meet me at the swingset afterschool”? I’m not condoning violence in any way, but there used to be consequences for being a jerk. Millennials have developed the mentality, as adults, that there are no consequences for how you treat other people. Kids that were jerks, typically grow up to be jerks as adults. Kids that are bullies grow up to be bullies as adults because we’ve given up on standing up to them. I seriously wish I had a dollar for every time I’ve heard a member of the younger generations say, “but that’s not fair!” You’re right, it’s not fair. Life isn’t fair, and you need to give up on the idea that it ever was. Sometimes things just don’t work out, and you need to pick yourself up and move on. In the Millennial generation, everything has been catered to make everyone happy. Try that out in the real world, and see where it gets you. Not to sound like an old man here, but back in my day – we didn’t have google to answer any question we might have. We actually had to learn stuff, retain knowledge, and be able to put it to use. When we took a test in school and failed, we didn’t pass the class. There was an actual emphasis on intelligence instead of an emphasis on making sure that no one’s feelings were hurt by being “less than average.” Learning things, the hard way, extended into every aspect of life, too. Just like losing, sometimes the only way to learn something is to do it and fail. As a kid growing up in the “analog era”, boredom wasn’t something that you could just grab your iPad to avoid. Boredom is what lead to discovery. Boredom is what developed your tastes in music, art, and literature. Growing up in a family that liked to take road trips is what developed my love for reading as a kid. Boredom is what got me out of the house and exploring the neighborhood. Millennials have forgotten that we all have this thing called an imagination, and boredom is its fuel. Now, I really don’t want to come off as a grumpy old man here because I remember older people saying the same things about my generation growing up. You know what? They were right. We can learn a lot from our previous generations, instead of doing everything not to be like them. Is a Can of Soda Really That Bad for You?